Not many scoreboards like these nowadays. 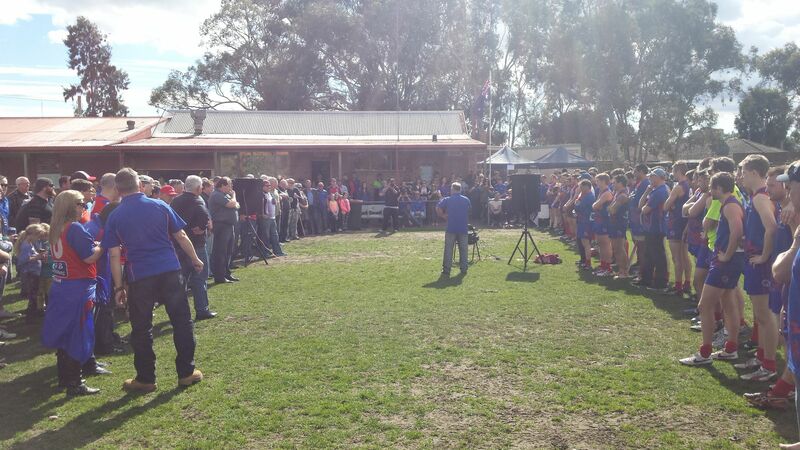 Mernda Football and Netball Club played its last games at its Schotters Road home on Saturday 23 August. Next year the club moves to brand new premises at Woodlands Waters Estate. The Mernda Recreation Reserve may look to untrained eyes like a ramshackle collection of old portables, add-on buildings (including the old Mernda Railway Station Masters Building), an ancient scoreboard and a ground that turns into mush at the first sign of rain, but I will be sad to see the home of the mighty Mernda Demons Football, Netball & Cricket Clubs become just another block of McMansions, because it is here where I began my life long love affair with our indigenous game. Not many footy jumpers like these nowadays. Life member Charlie Moore proudly wearing his 1964 premiership jumper, even if the white letters on the front have pretty much disappeared. Charlie played in that premiership with my dad’s cousin, Detlef Petersen, whom I mentioned on The Footy Almanac site recently. At the last game at Schotters Road there were a few guys in their old jumpers: Maroon & White M from the 70’s, the Royal Blue & Red Yoke from the 80’s, the Red & Blue Sash from the 90’s, and the Red with Blue Spikes from the 00’s, but Charlie’s was the oldest and this was the most ratty looking! Pre-game ceremony about last game at Schotter’s Road. Once, a big staple for rasing funds for local footy clubs, the old dice game of Crown & Anchor has shrunk in popularity of late because of wonderful government regulations. 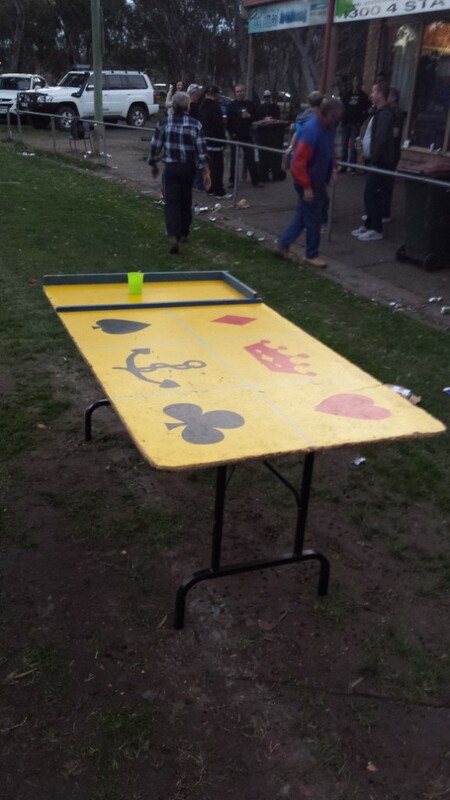 But we brought it back for about an hour after the game and the club made a good $700 on the table. I had to play for old time’s sake – Dad ran it after the games, and a lot of the kids, including me would put in 20 or 50 cents a throw. If you did that now, you would have your arse sued! Below is the final scores for the reserves. A big win indeed. 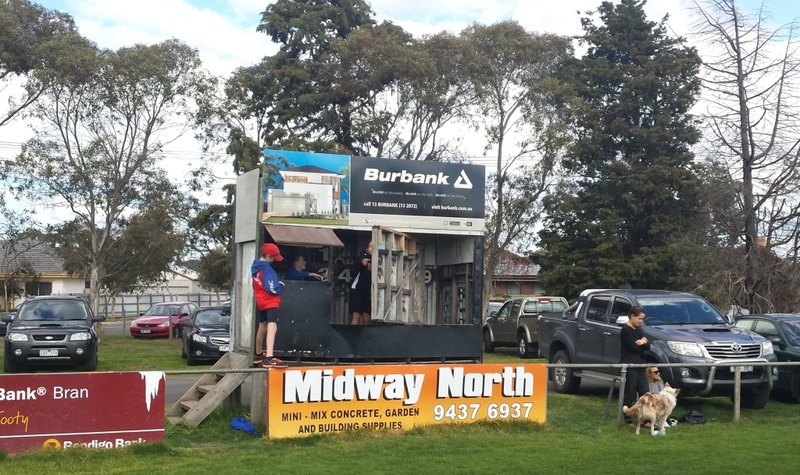 I hope the young boys can still do the new scoreboard at the new ground. The club was formed in 1891 as the South Yan Yean F.C before changing to Mernda before World War 1, then to the Plenty Rovers Football Club in 1932, when Mernda merged and moved out to Doreen. It returned to the name of Mernda in 1965 when the State Electricity Commission forced the club out of Doreen and back to the Mernda Recreation Reserve, after the SEC extended the power lines over the Doreen ground, making playing football almost impossible. The club has collected 21 senior premierships in various local competitions, the most recent in 2012. The seniors lost to Panton Hill. 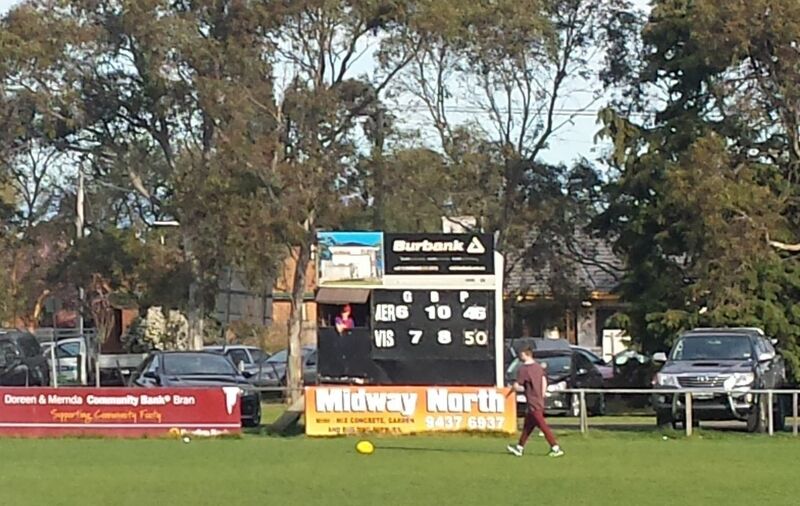 The final score for the final game was Mernda 6.10 (46) Panton Hill 7.8 (50). I would’ve done a write up about the Mernda Football Club moving to its new home, but the club spent another year at Schotter’s Road, making it the home ground of the Mernda Football Club for 50 years exactly. The future of the Schotter’s Road ground is a mystery, there have been rumours that it will be turned into two soccer/rugby pitches, or even as a picnic ground & play area, despite all this, I hope that it’s used for what it was intended for, to provide an area of recreation for the people of Mernda. Sadly, 2015 was an unhappy one for the club with the Seniors registering only 1 win for the season & therefore, were relagated to the Northern Football Leagues 3rd Division in 2016. After all the stuffing around that the Football, Cricket & Netball Clubs has had to endure with the delay to the construction of the facilities to the Woodland Waters estate, the keys were just handed over to the Cricket Club & they will be the first club to play on the new grounds in 2015/16. 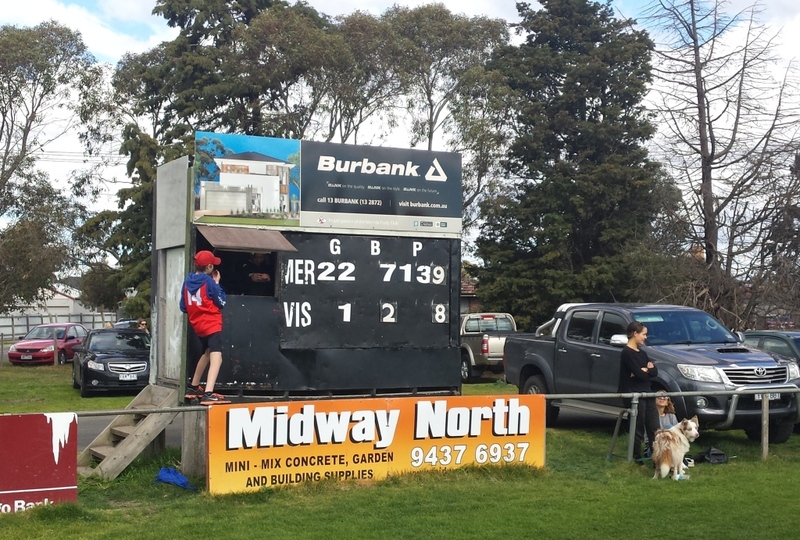 The scoreboards for the two grounds haven’t been built yet, but everything else has been done, and now it’s starting to look like a real home for the Football, Netball & Cricket Club. it was good to come across this article. My grandfather is Detlef Petersen (from Mayfield Farm) and my dad Peter McNair also played for Mernda and pretty sure thats where he met mum (Gayle Petersen). Thanks for sharing, great memories for many I’m sure. Thanks for visiting Scoreboard Pressure, Michael. ‘Appreciate you taking the time to comment as well. Regards, Vin M.